I first became interested in hi-fi when I was in my early teens. My initial venture into ‘hi-fi’ involved me buying a japanese amp and the biggest speakers I could afford. I soon realised this was the wrong approach and decided to seek out some ‘real’ hi-fi. Local to me there was a small specialist hi-fi shop owned by a guy called Rob. He was very helpful and I ended up buying a Creek CAS4040 integrated amplifier. Following this I bought a pair of Castle Clyde speakers and a Rega Planar 2 turntable. I was bitten by the hi-fi bug. On Saturdays I hung around the hi-fi shop and pestered the owner into giving me a Saturday job. The Saturday job lasted over ten years during which time I worked with Rob to sell thousands of systems ranging from £300 to well over £10,000. My hi-fi is now over thirty years old and therefore only of relevance to anyone interested in buying similar items on eBay etc. My hi-fi as it looks today. This was the first mid-range turntable by Roksan who were principally known for the excellent Xerxes turntable. The Radius came with the Tabriz tonearm but was also available without any arm. I chose to use the Rega RB300 tonearm which sounded better than most other tonearms costing five times as much (and certainly better than the Tabriz). My Radius has the Corus Black cartridge, the optional DSU power supply and sits on a dedicated three-legged stand. Roksan’s first CD player and one of the most distinctive hi-fi products of the time. Very ‘analogue’ sounding for a CD player, if a little lacking detail. The transport was always regarded as being the better part of the pairing. Matches the Radius with the same grey ‘Nextel®’ finish. I bought one of these amps secondhand from a customer in 1991. Myst were a very small company that existed in the mid-eighties who produced only this amp, a matching tuner and the earlier multi-box ‘G-Ohm’ pre/power amplifiers. 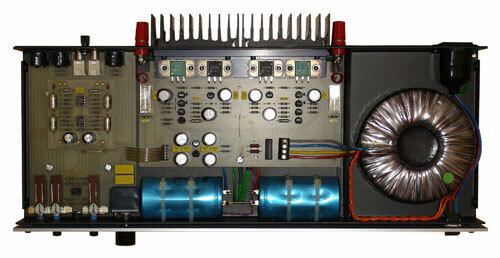 This amp was only produced in very low volumes and is built to impeccable standards. Below is a photograph of the inside which shows the care with which they were built. In 2005 I purchased on eBay a second, earlier, example of the tma3 which I use with a pair of small B&W LM1 loudspeakers and an Airport Express. Both the amps, with serial numbers #101 and #465, function perfectly which is not bad for twenty year old items. Previously I had owned a Naim Nait 2 and various other British amps but at the time I rated the Myst’s ability to rein tight control over loudspeakers at all volumes as better than any other amp under £1000. I also love the minimal styling of this amp. Originally a small start-up subsidiary of B&W loudspeakers, Blueroom then became an independent company and record label based in Worthing. Their most popular product was the Mini Pod model. In the late 1990’s manufacture of Mini Pod speakers transferred to a Danish company called Scandyna (www.podspeakers.com) who now produce a full range of pod loudspeakers. 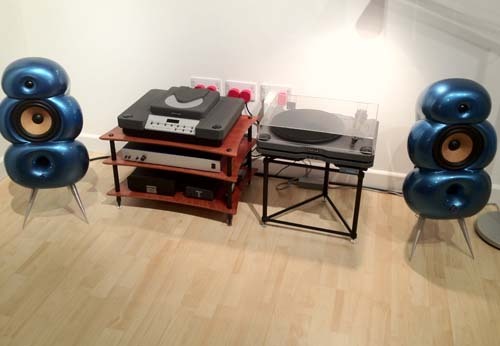 Simon Ghahary was the designer of these original speakers. There is a great history of the company on the futureshapeofsound.com website. My speakers are very early examples (serial numbers #543 and #544) of the full size domestic speaker, the House Pod, and sit on the machined aluminium ‘Sputnik’ stands. These date from 1992 (when the company was owned by B&W) and were originally in white. In 1999 they suffered some minor scratches which resulted in a magnificent metallic blue respray job by Blueroom in Worthing. Since posting this webpage I have had a number of people contact me, offering to buy the speakers. At the moment I have no intention of selling them.